Are you a smoothie fanatic who can’t get enough juicy smoothie information and delicious recipes? While you’ll certainly find a number of healthy smoothie recipes and tips throughout the pages of this site, I can’t possibly capture everything smoothie. 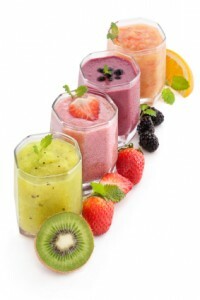 That’s why I put together this “master” list of other fantastic smoothie websites. Each smoothie site below has a slightly different angle on smoothie making. For example, some are geared more towards a particular diet, such as vegan, while others are all about health, whole foods, and/or losing weight. DaNae Johnson is the smoothie master behind this wonderful site. She offers a plethora of great recipes, information, and a couple smoothie eBooks. I aspire to one day have my site full of as much wonderful information and healthy smoothie recipes as her Smoothie Handbook. For green smoothie enthusiasts who are on or curious about a raw vegan diet, Incredible Smoothies is right up your alley. Tracy Russell shares her story of better health and weight loss through the consumption of green smoothies. She’s very active in posting new recipes and sharing her smoothie wisdom. One of the pioneer’s of green smoothies, Victoria Boutenko (and her family), offer much more than green smoothie recipes through her websites. Learn about green living, gardening, and healthy meals for the whole family. Victoria’s book, Green Smoothie Revolution, is a must read for the serious green smoothie maker. Another green smoothie pioneer, Robyn Openshaw, aka the Green Smoothie Girl, has a website loaded with information on health and nutrition that goes well beyond smoothies. You’ll find a plethora of information on the various aspects of optimum health, such as exercise, weight loss, certain food groups, alkaline food, and much more. A fabulous and beautiful site by green smoothie enthusiasts Jadah and Jen. For green smoothie lovers, this is a must visit. Not only will you find delicious green smoothies recipes, but other healthy eating tips, a kids corner, and much more. Great little site with plenty of fantastic smoothie recipes and nutritional information. Another fantastic smoothie site loaded with healthy recipes and great information by Daniel Pelegreen and several other contributors. Katherine, the founder of Green Thickies, has put together a wonderful site full of information on green smoothies and the myriad ways they can improve your health. One of the premier smoothie sites on the internet, I hesitated to add this to this list because not all of their recipes are of the healthy variety, but I didn’t want to throw the baby out with the bath water. If you’re a regular reader of my site you should have the knowledge by now to make a few substitutions and quickly convert an unhealthy smoothie into a healthy one. There you have it, the ultimate collection of healthy smoothie websites. I purposely didn’t include any franchise smoothie outfits because those generally don’t serve the healthiest smoothies. Please leave a comment below and let me know what you think of this list. Did I leave any sites off that you think should be included? Have any of these sites impacted your smoothie making and health? Cheers! Thanks for the ebook. Can’t wait to try the recipes. You’re very welcome, Anntonette. I hope you thoroughly enjoy the recipes! Cheers! It was my pleasure gathering this list of smoothie sites – actually have a few more good ones to add. Your site is the best. No need to surf anymore. You have done it all so well. Thank you very much. I would like to sign up for your newsletter and free recipe eboook, however, I do not have a Facebook account. I hope that with my email address you will be able to forward a copy to me. You can sign up with an email address – check your email to confirm. Great list, I just wanted to let you know that there’s a smoothie calculator website at https://smoothiegains.com/smoothie-calculator/ that should probably be included in this list. I use it to keep track of the nutrition value of my own smoothie creations. Thanks for the tip, Chad.